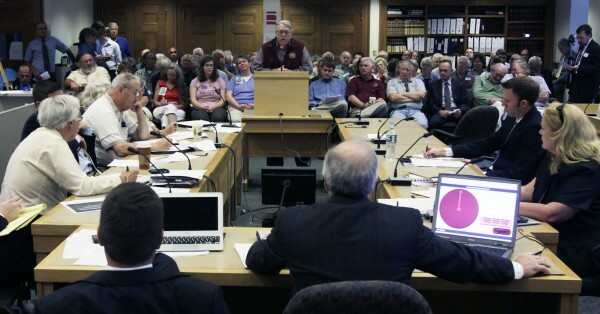 Mainers testify before the Reapportionment Commission at the State House in Augusta, Maine, on Tuesday, Aug. 23, 2011. AUGUSTA, Maine — Before they reached a compromise at the 11th hour, Republicans and Democrats in Augusta fought — sometimes bitterly — over how to redraw the line separating Maine’s 1st and 2nd Congressional Districts. In the final days before the Legislature approved a redistricting plan, Republicans threatened to pass through their initial plan with a simple majority vote. Republicans hold a majority in both the Maine House and Senate. Democrats opposed that plan and accused the GOP of trying to muscle through a radical shift that ultimately would have made the 2nd District more competitive for a Republican candidate. Although Republicans abandoned this option, they were well within their right to pursue a majority vote because nothing explicitly spelled out in state law required anything more. Both parties hope 2011 is the last year the redistricting process is dominated by bitter partisanship. Although the question seems complicated, the proposed change simply seeks to put Maine on the same timeline as other states, according to its sponsor, Rep. Dennis Keschl, R-Belgrade. In the past, the redistricting process started three years after new Census data was released and therefore did not affect the first congressional and legislative elections after the Census years. Maine was the only state in 2011 that did not complete state legislative redistricting to reflect the 2010 Census. Congressional redistricting, which was slated for 2013, was completed this year because of a federal court order requiring a more timely realignment of the state’s two districts. And although it’s not stated in Question 4, the amendment also would require a two-thirds majority vote in the Legislature on any redistricting plan in the future. Keschl, who sponsored the constitutional amendment on behalf of a constituent, said he understands that congressional and legislative redistricting is inherently partisan, “but that doesn’t mean the parties shouldn’t be working together in the best interests of Maine people,” he said. That’s ultimately what happened when the 125th Legislature convened for a special session in late September to vote on redistricting. The plan that passed was not the first choice of Democrats or Republicans but represented something of a compromise between the party’s initial plans. Although the redistricting battle in Maine was ugly at times, other states have seen much worse. In Texas, which added four U.S. House seats after the 2010 Census, the redistricting process was used to force out an incumbent who clashed with Gov. Rick Perry. In North Carolina, it was used to make re-election harder for a North Carolina Democratic representative who a decade ago used redistricting to make things unpleasant for Republicans. Utah, Missouri, Illinois and Pennsylvania are among the other states where redistricting has been used by one party to reshape the electoral map. During this year’s process in Maine, some argued that the partisan tone was set by the makeup of the redistricting commission. Only one person, the commission’s chairman, was an unenrolled voter, but unenrolled voters represent the largest bloc of Maine voters. Several states, including California, Arizona and New Jersey, turn the redistricting process over to an independent, bipartisan commission. Maloney and Keschl agreed that it probably makes sense to involve unenrolled voters in the redistricting process but they also said the commission did reflect the makeup of the Maine Legislature.